Google CEO- Sundar Pichai is a hero among many engineers in Silicon Valley, where he helped build some of Google’s most popular products and climbed the ladder to the top of the internet giant. In Washington, he’s a relative nobody. Mr. Pichai will be thrust into the political spotlight when he testifies at his first Congressional hearing on Tuesday. Members of the U.S. House Judiciary Committee are expected to grill the executive on a range of topics, including Google’s handling of user data and its development of a search engine that would comply with China’s strict internet censors. He agreed to GOP requests to appear before the committee prior to the 2018 election. For Mr. Pichai, a former semiconductor engineer who has shied away from public appearances for most of his three years as CEO of Google, a unit of Alphabet Inc.,GOOGL -0.06% the Washington visit will test his ability to take on a new role as the public face of a company increasingly confronting harsh regulatory scrutiny. Google faces the prospect of regulations that could make it costlier to operate an online ad business expected to generate more than $100 billion this year. Lawmakers have held hearings in recent months discussing the need for stronger federal protections governing the collection of online data and state attorneys general have begun coordinating a legal strategy to confront tech firms on alleged antitrust violations and over what some Republicans say is a suppression of conservative speech. Mr. Pichai, 46, joined Google in 2004 and ascended the company’s ranks, spearheading the successful Chrome web browser and overseeing the expansion of the Android operating system. When the company reorganized Google as a division of Alphabet in 2015, Mr. Pichai was named CEO of the key strategic business that includes search, YouTube and online ads. The executive’s relative inexperience in Washington contrasts with his predecessor Eric Schmidt, who, during a 10-year stint as Google’s CEO from 2001 to 2011, cultivated powerful political allies such as former President Barack Obama and held sway with both parties in Congress. During the Obama years, Google defeated an antitrust probe by U.S. regulators and secured favorable policies on net neutrality, online liability and copyright issues. 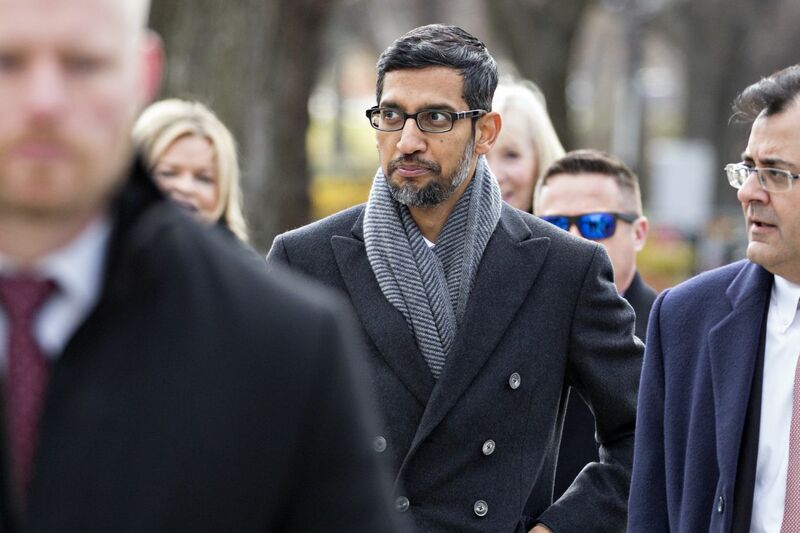 Mr. Pichai “came to this country as an immigrant with no resources and rose to lead one of the most powerful and influential companies,” said Rep. Ro Khanna, a Democrat whose district in California includes Google’s headquarters of Mountain View. Mr. Pichai has been working to build stronger alliances with GOP lawmakers and conservative-leaning groups, according to internal company discussions. In a companywide conference call with employees earlier this year, a top Google public policy executive said that Mr. Pichai has pushed the Washington office to make more friends on the right and occasionally pitched in on the effort, like when he traveled to Tennessee in February to attend a groundbreaking of a new data center with GOP Sen. Bob Corker. Since the GOP’s electoral sweep in 2016, “one of the directives we’ve gotten very clearly from Sundar in his leadership is to build deeper relationships with conservatives,” said the executive, Adam Kovacevich, according to a recording reviewed by The Wall Street Journal. That’s because of the perception in Washington that Google and its employees lean to the left. Google didn’t respond to a request for comment. The post Google CEO Faces Hot Seat in Washington appeared first on erpinnews.